Author Jeffrey E. Barlough was born in Los Angeles in 1953, and obtained his Bachelor of Science degree from Loyola Marymount University in 1975. He received his veterinary degree from the University of California, Davis, and a Ph.D. in virology from Cornell. He has been publishing scientific journal articles, novels, and non-fiction books on a variety of subjects since the 1970's. He began sketching out ideas from what was to become the Western Lights series as early as 1988, but did not begin actual writing until 1995. The first volume, Dark Sleeper, received starred reviews from Publishers Weekly and Kirkus, and was judged one of the top sci-fi and fantasy books for 2000 by barnesandnoble.com. The second volume, The House in the High Wood, was nominated for a Locus Award for Best Fantasy Novel in 2002. And Strange Cargo (2004), by far the most intricate of the books to date -- having not just one but three mysteries in it -- has been called "fantasy at its best" by the Midwest Book Review. 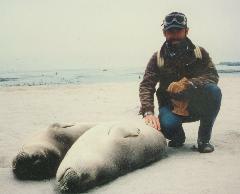 Author and veterinarian Barlough and slumbering friends (northern elephant seal weanlings, Mirounga angustirostris). Photo taken during a government-sponsored research cruise to assess the health of marine mammals on San Miguel Island, California. San Miguel served as a model for the islands of Soar and Windwhip in Strange Cargo. (Photo by Dr. Gene Berry). Featured image by Gary E. Barlough.